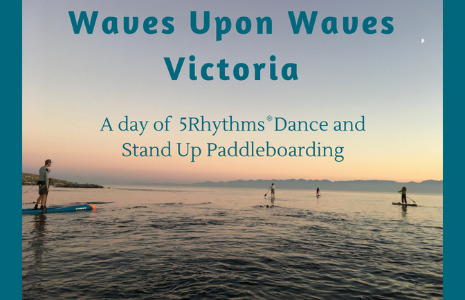 Join Anne Marie Hogya and Gina Lemieux for a day of movement with their unique offering of 5Rhythms dance and Stand Up Paddleboarding! Gabrielle Roth, the founder of the 5Rhythms Practice, said "Once you awaken your intuition and get in the habit of listening to and acting on it, every decision in your life will become reflective of your inner truth. The trick is not to try to work out all the answers in your head. Rather take whatever information you need into your body, trust your gut, then dance or meditate or walk or do whatever you need to enter a relaxed state of being and you'll know what to do. You always have and you always will." Gina will guide us on paddleboards on the ocean where we can explore and experience Flowing, Staccato, Chaos, Lyrical and Stillness® on the water. As we learn to respond to the energy of the water, it will inform us and create a sense of oneness. The ocean is a great source of healing and inspiration. During our time on the water whisper your desires to the ocean, and see what inspirational guidance it has to offer. After experiencing the rhythms of the ocean, we will come back to land and spend the afternoon guided by Anne Marie immersing ourselves in the Waves of the 5Rhythms practice on the dance floor. The element of water will be our through line and our medicine as we seek healing, inspiration and the possibility for gentle transformation. Gina Lemieux is a professional life coach and marine biologist, a Paddle Canada Stand Up Paddleboard instructor, and has been dancing the 5Rhythms since 2014. Through her deep love of the ocean and appreciation of the benefits from movement, she offers a unique fusion of coaching and paddleboarding where additional clarity and solutions for igniting your goals into creative action are revealed while enjoying movement in nature and the exploration of rich, diverse marine life. Anne Marie Hogya is an accredited 5Rhythms teacher who has a fierce commitment to truth seeking and is passionate about helping people push their edges, increase their awareness and create the possibility for change. She is known for her no-nonsense speaking combined with a relentless sense of humour, compassion and courage. Anne Marie studied under Gabrielle Roth and has been practicing the 5Rhythms since 1999; she is accredited to teach Waves and Heartbeat. In addition, she has a Masters degree in leadership. She lives in Canada and teaches at home and internationally. No dance or paddleboarding experience necessary. An introduction to paddleboarding will be provided by certified Paddle Canada paddleboard instructors. Please note that we will be paddling on relatively flat water (no big waves or surf) and high quality paddleboards, paddles, lifejackets and leashes will be provided by South Island SUP.